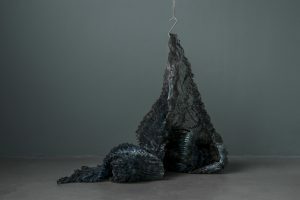 Charlotte Østergaard is a visual artist working in between costume, fashion and textile objects. The last 23 years she has worked with the body as a cultural and artistic expression. Charlotte has received several grants from the Danish Art Foundation and has exhibited at curated national and international exhibitions. From 1999 to 2014 Charlotte designed the fashion collection Charlotte Østergaard Copenhagen – a collection based on a passion for pleating techniques. Techniques which transforms two-dimensional material into three-dimensional moveable shapes/forms/clothing. 10. – 14. juni 2019 Performance “Traces of Tissue”, Site Specific Performance Festival at Prague Quadrennial 2019.